Despite the United States’ long-standing love affair with the automobile, our country is outranked by a several nations in terms of cars per capita. According to The Atlantic, the U.S. is ranked No. 25 in the world, coming in below Bahrain and just above Ireland. Reporting on a new paper from the Carnegie Endowment for International Peace on worldwide car usage, The Atlantic states that American per capita car ownership rates are actually among the lowest in the developed world. According to the report, there are 439 cars in the U.S. for every thousand citizens – approximately two people for every car. The number is higher in almost every Western European nation, and even in places like Japan, Australia, and New Zealand. Surprisingly enough, even countries that have been recently entrenched in financial crises like Iceland and Greece have a higher per-capita number. Italy and New Zealand nearly double the per-capita number in the U.S., while the exotic city-state of Monaco along the French Rivera lead all countries with 771 cars per 1,000 citizens. So what to the numbers mean? The Carnegie paper states that the group looks at worldwide car usage as part of a bigger picture. They associate the number of cars per capita to determine the strength of the middle class in a particular country. 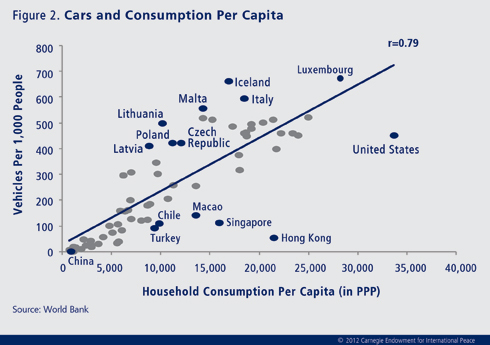 When looking at the number of cars per capita versus household consumption per capita, the numbers are even lower. In general, households who spend more money on average usually spend more on cars. However, the U.S., which had the highest household consumption, ranked much lower than several smaller countries like Italy, Lithuania, and Iceland. However, The Atlantic points out that comparing the middle class across countries can be challenging. The difference in middle classes between nations can be great. A middle class citizen in one country may in fact be wealthy or even poor in another. One supporting factor in the decline in the American middle class from the Carnegie paper is that the number of cars in America that the group classified as “luxury cars” were particularly high at 9.6%. Perhaps what is still more surprising is the fact that despite the U.S.’s relatively low number of cars per capita number, Americans still use more energy per person than anywhere else in the world, and by a massive margin. In fact, our oil consumption is about twice as much as the Western European nations who outnumber us in cars per capita.